Efficiency gains are also likely. Today, most cars spend most of their time idle, and even when they’re moving, they frequently carry a single person, a tremendously inefficient allocation of resources. That could change not just through smartphone-enabled car-pooling and reduced vehicle ownership, but also because automation would change driving itself. Cars that couldn’t crash could be made lighter, and they could pack closer together on freeways and travel in platoons, reducing congestion and, eventually, the amount of space cities devote to roads. Intelligent roads, Mr. Heck and Mr. Rogers argue, could save untold numbers of lives and hundreds of billions of dollars. That’s the dream. But the path to full automation isn’t likely to be smooth or quick. Although Google recently announced that it would soon begin test-driving self-driving cars, many experts said they believed that fully autonomous cars for the public were at least a decade away. Even without such technology really being used, cars remain enormously popular across the U.S. — and much of the rest of the world. If some of this get adopted, it will be interesting to see at what expense and what it will do to traffic (if anything) and transit. There are two schools of thought: such technology could heighten the appeal of cars and thereby diminish the ability of transit to attract discretionary riders (i.e. those who could drive). The alternative: driving and traffic will remain expensive and burdensome, thereby guaranteeing there’s always an audience of people who want an alternative to getting everywhere by car. The number of miles driven by Beaver State denizens has been dropping. Why? Simple answer: the state is getting more urban and the emptier rural spaces are getting emptier, thus a drop in lots of long drives on long rural roads. To a lesser extent, Oregon has also done a good job with public transportation and containing sprawl. Let’s look at Multnomah County, which includes Portland. About 61 percent of workers commuted by driving alone, 9.5 percent carpooled, 10.7 percent took transit, 5.2 percent walked, 6.2 percent biked or took other means and 6.9 percent worked at home, according to the latest numbers from the U.S. Census Bureau. 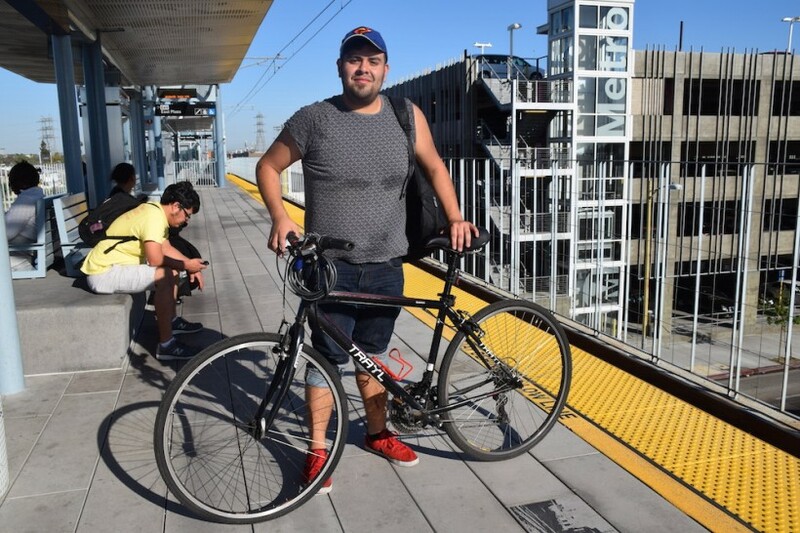 Those numbers for Los Angeles County: 72.4 percent of commuters drove alone, 10.6 percent carpooled, 7.1 percent took transit, 2.9 percent walked, 2.1 percent biked or took other means and five percent worked at home. Probably not an entirely fair comparison, considering L.A. County dwarfs Multnomah County in terms of size and population — 10 million people versus about 735,000 people. That said, I don’t see a reason that L.A. County couldn’t increase the number of people who take transit, walk, bike and work at home. The five rail projects underway should help, especially with two of them (Expo Line and Purple Line Extension) eventually serving the job rich Westside. One other thing. The commuting stats in Los Angeles County vary greatly by city. For example, in Santa Monica only 3.8 percent of people take transit, 5.6 percent walk, 5.1 percent bike or take other means and 9.5 percent worked at home. On the subject of Portland…. Will Alvarado. Photo by Zocalo Public Square. The latest rider profile by Zocalo. •The television show everyone should have been talking about yesterday was the season finale of “Silicon Valley” — not the overly violent, exposition heavy and leaden “Game of Thrones” bloodfest. If you’re the type that downloads television shows and watches them online, I’d put “Silicon Valley” at the top of the list. It’s only 30 minutes long (good for transit) and it’s a hilarious satire of the tech scene in the Bay Area and the techy times that we live in. To put it another way, I’m a lot more worried about the fate of Galvin Belson than I am about John Snow. Feel free to follow my mostly non-transportationy thoughts and photos on Twitter and Instagram. I sent you an email but never got a response. Sorry about that. Please try again: hymons@metro.net. OTOH there’s also a third thought: such technologies themselves can also make their way to the next generation of buses too. It’s not like self-driving technologies and computerized safety features can only be put into automobiles. If it can be done in cars, then it will be possible in vans. Then shuttles, and sooner or later it will be a standard feature on buses too. So if autonomous cars don’t solve the problem, perhaps autonomous buses will. You need to expand your thought to such possibilities too rather than looking at autonomous cars as a standalone product. What features in an autonomous car can be positively utilized for next gen buses?